There have been a total of 94 submissions nationwide with 43 of those coming from the Midwest Area. The numbers were reset on July 1, 2017 so anything after that has counted for 2018. At this time last year we had 52 submission so we are a little behind. From the national level 12 submissions have received responses and 9 were sent to negotiations. The National Programs Chair stepped down in October and a new one has taken over. There has been a delay in getting the program submissions directed to who they need to go to and forwarded on. I have responded to all the program submissions I have been given to date. If you have not gotten a response on something you submitted, please let me know so I can find out where it is. Congratulations to both Indiana and Illinois for tying! Each of you should have picked up a Programs Flyer from the registration table. 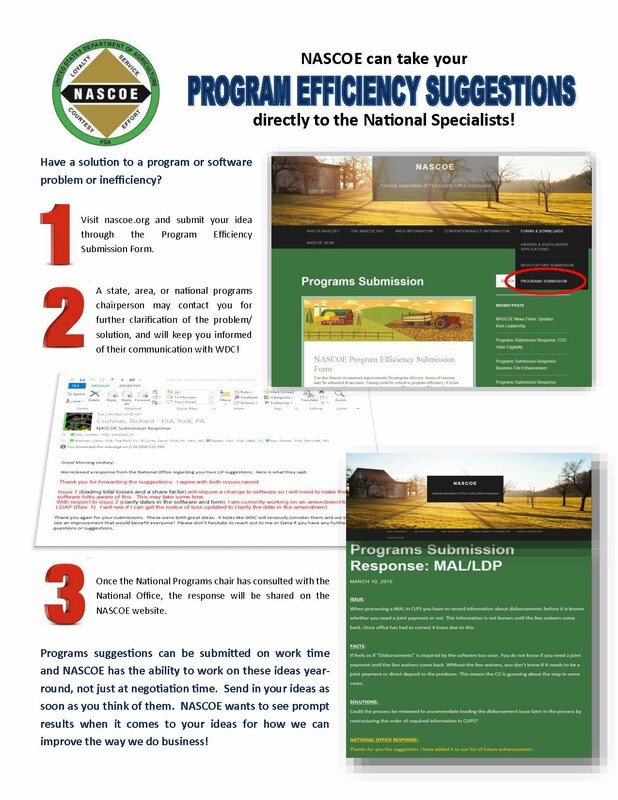 This is a one-page instruction sheet on how to submit a program change or request through eh NASCOE website. This is how we can get our software modified, along with some minor program rules changed. This past year one example of a change is in ARC/PLC. There is now a “return to producer list” option so you can go back to the list of contracts without having to search again. This suggestion came from someone out of the MWA and it was changed for the better. I encourage each of you to submit one issue. This would bring our number up and help each state with their total for the year. I am issuing you all the challenge of getting a total of 80 submissions for the year. We are a little over half way there. Let’s make the rest of this year count and show NASCOE who the MWA really is! Thank you for allowing me the opportunity to represent the MWA for Programs. If you have a new state chair, please let me know. Also, if there is something you would like me to do for your state or you don’t hesitate to ask.